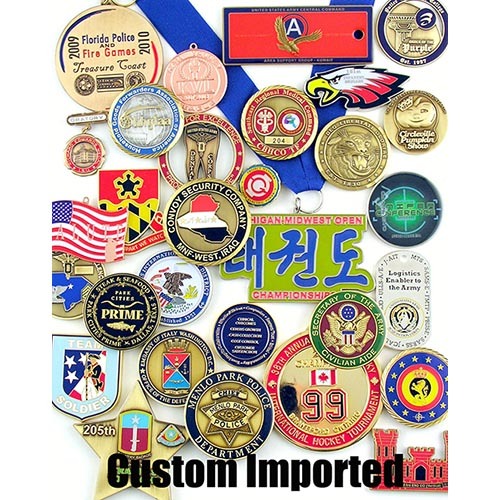 We can make or import these custom items. Yes, we are proud to be a USA manufacturer, but we know that sometimes your custom needs may have a budget we cannot accommodate or you may have a design that is better suited to an imported process. FAQ For Imported custom products. Die Charges – A one-time charge. Dies are held for your use for two years from the last date the were used. Sizes – ½” – 4” in diameter plus many other custom shapes. Finishes on the materials we use - brass plating, gold plating, nickel plating, copper plating, antique gold plating, antique nickel plating, antique copper plating, frosted gold plating with polished highlights, frosted brass plating with polished highlights, frosted nickel plating with polished highlight and frosted copper plating with polished highlights. Delivery – Five to eight weeks for new orders, four to five weeks for reorders. Options for Imported custom made products. Color Fill – Color fill can be added to any design. We need to create a cavity to hold the epoxy. Please provide PMS colors as a reference for color matching. Soft enamel fill, this looks like paint that covers the cavity, it does not fill the cavity, Minimum cavity size is 1/32. We can also do hard enamel, this fills the cavity with color. Minimum cavity size is 1/16”. Diamond faceting on the edges of round items. Stamped or engraved consecutive numbering. Selective plating – Gold or silver.